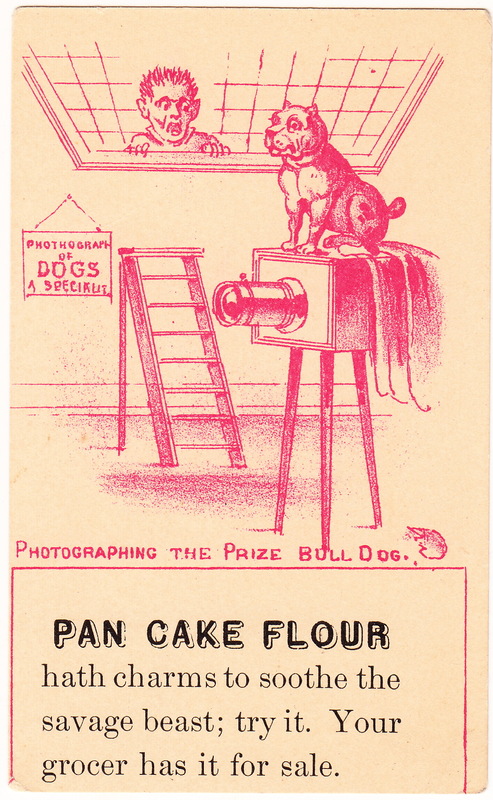 Photographing the Prize Bull Dog.” Trade card for Pan Cake Flour, ca. 1880. Chromolithograph. Publisher unknown. Studio photographs of dogs from the second half of the 19th century are abundant. Thus it was inevitable that someone would satirize the process of getting a good image of an unwilling canine subject. There are a number of interesting things about this little trade card from the 1870s. First, photography of dogs is a “specialty” of this studio! The camera is a typical expanding camera of the 1870s with a large portrait lens and the drape for the photographer. Terrified, he has jumped out of the large window that provides light for the studio and is watching his subject, a very muscular bulldog with a docked tail and cropped ears who has taken a position on top of the camera and looks very pleased with himself. I wonder where the owner is? This fellow may be a fighting dog who has been brought in for a portrait. If he has won a prize (since competitive dog shows were just beginning to appear in the U.S. in the mid-1870s), it would for prowess in the ring. Although dog fighting was a controversial, stigmatized, and increasingly illegal activity at this time, it was a common betting sport. However, bulldogs or bull terriers of several sizes and shapes were popular watch dogs because of their reputation for aggression. At a time when police protection was uneven, they were a common means of security for private households. Bulldogs and bull terriers do show up in photo portraits as pets, often as the companions of men. 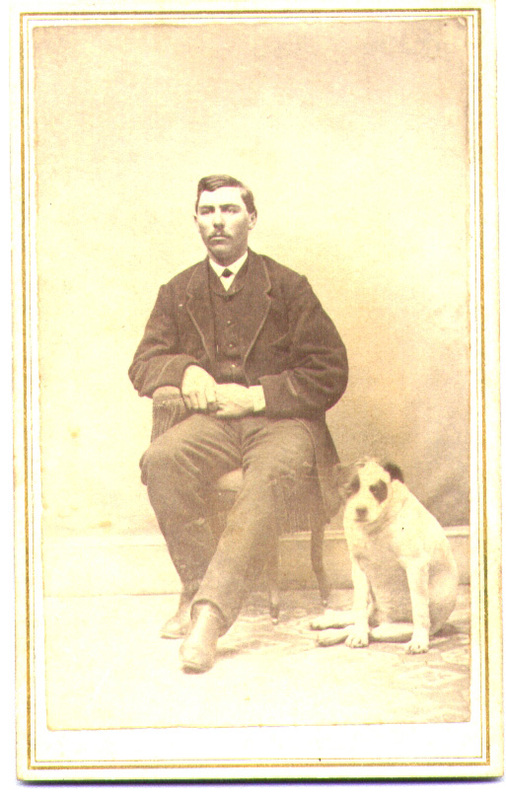 Here is a carte-de-visite of an unidentified man and his bull terrier- type dog from the early 1860s. I don’t think this dog threatened the photographer; the man looks scarier than the dog! Unidentified man with bull terrier. Carte-de-visite, R. H. Lincoln, Photographer, Somerville, NJ. A two-cent tax stamp on the back dates the image to the Civil War. Previous Do you smell something funny?